This set is just a bit of fun, decanter 10 inches tall, hollow stopper, glasses 2 inches, made in France...but for what (presumably mind-blowingly strong) drink? Also 50's or 60's? Anyone? ps: I just love this site! I have a similar decanter set by JG Durand in its original box, which says it's for gin. My guess is mid-late 60s. Thank you-do you have a photo available, I would love to see it. But going from memory, my decanter is quite similarly styled, and the stopper is near-identical. My glasses have quite heavy bases, though, and a curved tapering shape. 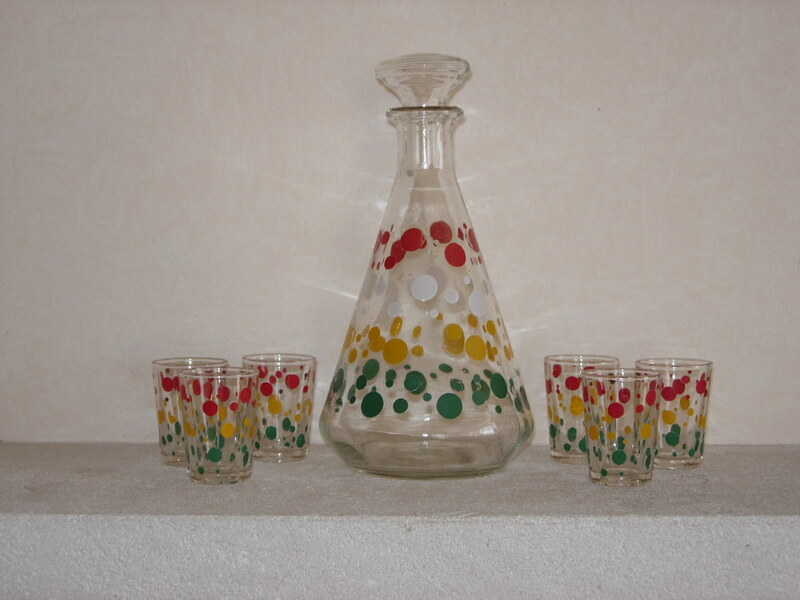 these are found a lot on fleamarkets in France, and yes they were made by Durand (aka Arques) in the 60s. Not rare, though seldom complete.